Whispers of the Dark Daeva now on sale! Thanks to all the playtesters who helped make the adventure better, and to Kate for doing the editing and layout. Hope you all enjoy it! Earlier tonight I appeared on a live online panel for the first time, talking about city and village supplements for fantasy RPGs as part of AetherCon V.
The panel was hosted by Craig E Goad of Star City Savages, and also featured John Bennett (Raging Swan Press) and James Gantry (Rogue Blade Games). It was good fun to do and I got to talk a fair bit about some of the stuff that went into Parsantium. You’ll be able to watch on YouTube once it’s been edited in January. Thought it was about time for an update on Whispers of the Dark Daeva! Kate has been incredibly busy with her day job as a freelance editor so we haven’t had much time to work on the adventure in the last few weeks. Nonetheless, we have managed to get the introduction, and first three chapters of the 5e version styled up and laid out, including stat blocks, art and maps. It was a year ago that I first asked you all how you liked to see monster stats presented in adventures and overall the feedback was in favour of including the stats on the page with the encounter description – my preference too as a GM. I want to make the adventure as easy as possible for the GM to run so that’s what we’re doing with Whispers of the Dark Daeva. This can prevent layout challenges but so far I think we’ve managed to achieve this while keeping the layout as clean and uncluttered as we can. Formatting 5e stats in InDesign has been a bit tricky too but we’ve cracked it now (I hope!) and things should be easier for the final two chapters. That’s just as well as these contain lots of monster and NPC stats. Once the 5e version is laid out, Kate will edit the text and then it will be on to the Pathfinder version. We’re off on holiday in the next few weeks too so it’s likely to be Autumn/Winter before the adventure is finally published unfortunately, but I’d rather take the time we need to get it right rather than rush things. I love the trinkets in the 5e Player’s Handbook and thought it would be fun to do a few with a Parsantine twist. A clockwork soldier made by the toymaker Skorrif of Wondrous Things; its sword is very sharp and it’s easy to cut yourself when winding up the toy. Please feel free to add your own suggestions in the comments below! And if you want more, these Southlands trinkets from Kobold Press would work well in Parsantium too. 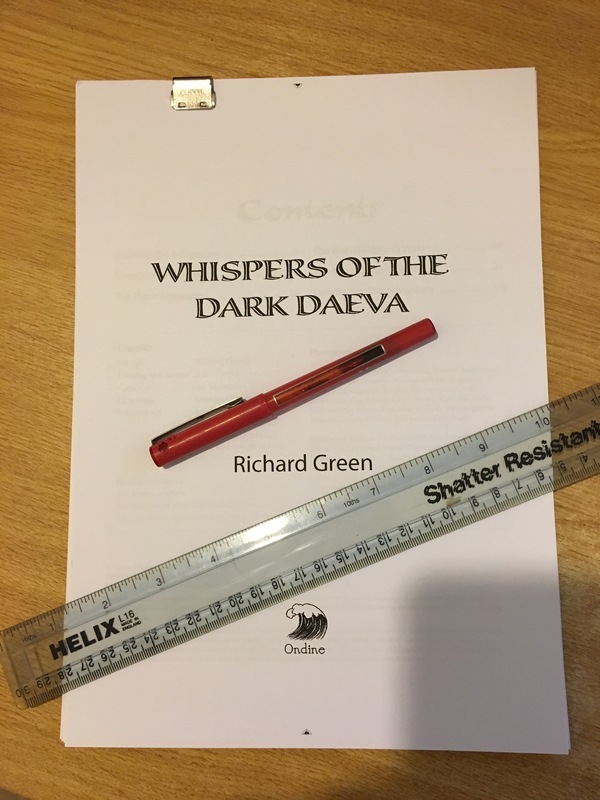 We’ve been on holiday this week so I’ve been able to make good progress on Whispers of the Dark Daeva, my forthcoming Parsantium adventure for 1st level PCs. I went through all the excellent feedback I received from the 5e and Pathfinder playtests in detail and made a number of improvements to the adventure, tightening up the story and the game mechanics. I’ve expanded some of the encounters and redrew the dungeon map with slightly bigger rooms to give the PCs and monsters more room to manoeuvre before tidying it up and labelling it in Photoshop. I had to remember to update both versions of the text too – thank goodness for Word’s track changes functionality. Overall, I’m pretty happy with the final drafts I will be passing over to Kate to edit. I’ve now copied the 5e draft into InDesign and styled up the headings and most of the text. InDesign is tricky to master but I am learning a few tricks here and there which is cool. We do still need to come up with a style that works for the 5e and Pathfinder stat blocks as this is the first Parsantium release that has included monster and NPC stats.